Student discipline—Under some circumstances it might be useful to disallow printing for a student who has misbehaved in class, abusing computer resources or for other disciplinary reasons. You can disable the user's printing for the duration of a class, or indefinitely. Once the time period has passed, printing is automatically enabled for this user. 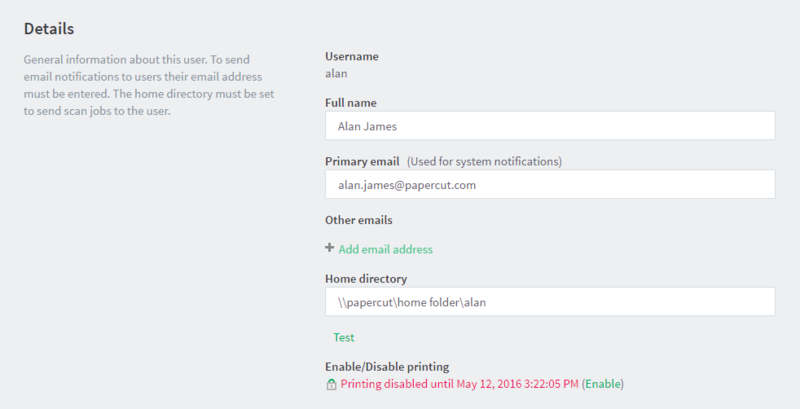 Classroom Management—Using the bulk user actions screen, you can disable printing for a group of users. This is useful to stop a classroom from printing for a period of time. User Management—If an employee or student is away for an extended period of time and will return, you can disable printing so that their details and balance is unchanged but no-one can use their account for printing. In the Details area, in Enable/Disable, select the period for which you want to disable printing.